Why we love it: The 1895-S is one of our favorite dates in the series as an underrated key issue that becomes especially scarce and desirable in AU and above. Its proof-like surfaces and attractive toning around the rim add to the scarcity and eye appeal of this coin tremendously. This example also comes in an Old NGC Holder with a notable lack of major blemishes that would be expected from this grade. Value: The PCGS Price Guide has this key S-Mint Morgan valued at $4,250 with its stunning proof-like surfaces. Even in this Old NGC Holder with lovely toning and captivatingly unique surfaces, we have this piece reserved in this week’s auction at $150 below the price guide at just $4,100. 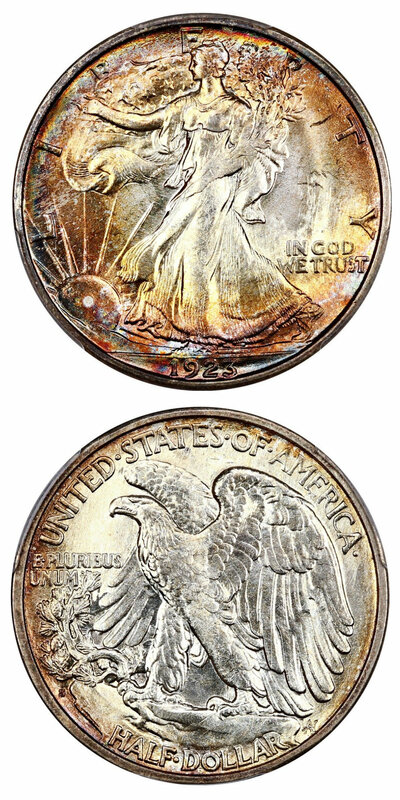 Why we love it: A scarce, early San Francisco minted Walking Liberty Half Dollar whose date is one of our favorites in the series. This beautiful gem is not only pristine and lustrous but also offers some of the nicest rainbow-colored toning you will see on any Walker. The toning features mostly light golden highlights that transition into a rose-gold as it gets closer to the pretty rainbow right at the rim. Value: Just last month another example from PCGS with the same date and grade combination brought a strong $18,000 at auction. Along with that past sale, a PCGS Price Guide Value of $17,500 and a CPG Value of $16,600, we are still reserving our piece at the low price of just $14,000 in this week’s auction. Why we love it: A popular and scarce early Gold Eagle type coin that originally comes from a mintage of just 37,449 coins struck. A notably strong strike for the issue that offers plenty of frosty luster over these beautiful bright yellow-gold surfaces. The eye appeal and grade level make this piece perfect for both the advanced type collector and early gold enthusiast. Value: Another example from NGC with the same date and grade combination brought $24,000 at an auction at the end of 2017. Along with that past sale, a generous PCGS Price Guide Value of $34,500 and a sizable CPG Value of $31,500, we are still reserving our piece at the reasonable amount of just $24,500 in this week’s auction. Why we love it: The 1796 Draped Bust Dime is known for being both the first year of issue for 10-cent coinage and for being a desirable numismatic rarity. This lovely choice VF example is completely problem free and displays light, even wear and pretty toning. The color is highlighted especially on the reverse by a gorgeous blue-green with a faint lavender hue. This coin can seemingly easily pass for a low-end XF with this level of surface quality and eye appeal. 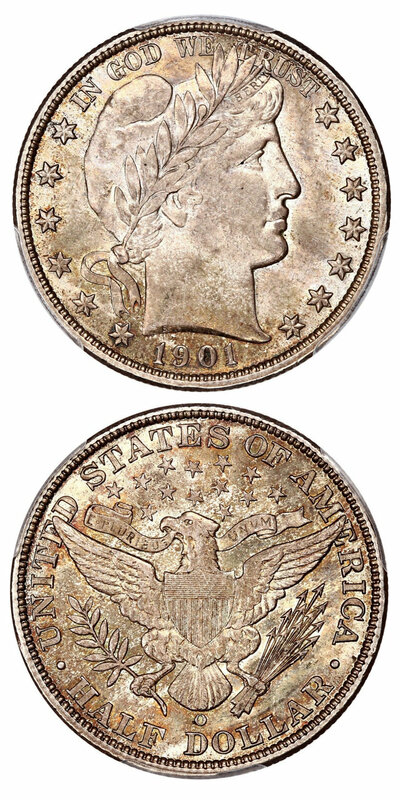 Value: At the end of 2016, a same date and grade combination from PCGS without CAC approval brought $8,225 in auction. 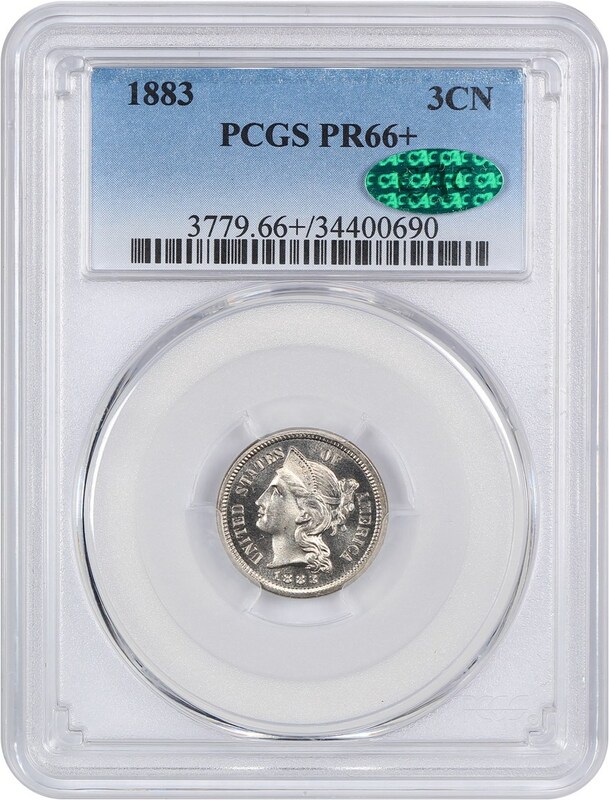 Additionally, the PCGS Price Guide Value of the coin is slightly higher at $8,650. We are still offering a best price for our piece at the reasonable amount of just $7,500 via our Make Offer Function even with CAC approval. Why we love it: A gorgeous example of this rare proof Quarter Eagle in which this exact date comes from a mintage of just 197 coins struck. This fresh, flashy gem displays nearly completely pristine bright yellow surfaces giving the coin perfect eye appeal and representing the CAC sticker well as it is truly high-end for its grade. Value: In 2017 another CAC’d PCGS example with the same date and grade combination brought $16,800 at an auction. Along with that past sale, a PCGS Price Guide Value of $17,500 and a CPG Value also of $17,500, we are still reserving our piece at the reasonable amount of just $16,250 in this week’s auction. 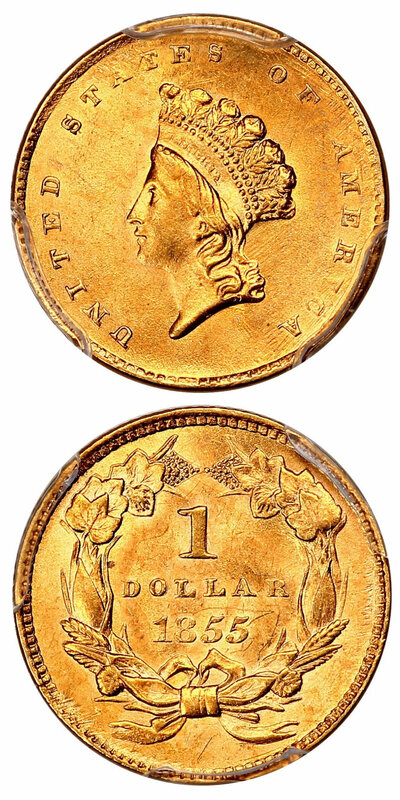 Why we love it: A popular and scarce Type 2 Gold Dollar from a mintage of just under one million with a survival estimate of only a few thousand. This near-gem displays fully original and ideal yellow-gold color along with excessive amounts of blazing luster. It truly represents the grade well as it comes as close to a gem as it gets in both overall look and lack of contact marks. Value: Just in October 2018, another example from PCGS of the same date and grade brought a strong $8,400 at the Baltimore Show auction. The PCGS Price Guide Value is $7,500 and the CPG Value is $7,880 making our best price via our Make Offer Function of $6,150 an absolute bargain. Why we love it: A popular and desirable New Orleans Mint Liberty Seated Half Dollar with beautiful luster and stunning toning. This lovely gem displays a rainbow toned obverse with hues of blue-green and rose-gold complemented nicely by a lustrous, golden reverse. There are only four other examples of this issue in existence graded finer by PCGS. Value: The two most recent sales of this same date and grade combination both took place in 2017 in which neither were our exact piece but both sales were of the same coin. It brought both the amounts of $12,600 and $14,000. Considering those numbers and a CPG Value of $15,100, we feel a best price of $13,000 via Make Offer is fair and brings an excellent value to the buyer. Why we love it: This New Orleans Mint Issue is a key date in the Barber Half Dollar series in which this high-end near-gem is bested by just nine other examples graded at PCGS. This CAC approved stunner could easily pass for a full gem with its pristine, lustrous surfaces that are nearly completely free of detracting marks and covered in lovely, natural toning. Value: The PCGS Price Guide and CPG Value should give great comfort to the potential buyer as their estimates are so unbelievably comparable at $7,000 and $6,900 respectively. That is not even counting the premium the CAC sticker brings as the value almost doubles in the next grade. At over a thousand below these price guides our best price via Make Offer of $5,750 is arguably a bargain. Why we love it: A great type coin for the Indian Cent series that is quite affordable yet still offers great beauty. This lovely gem displays pristine, rich blazing red surfaces that are completely original and full of incredible luster that all come together to create nice eye appeal. Value: Offered via our Make Offer function for $500, this coin has a higher PCGS Price Guide value of $550. 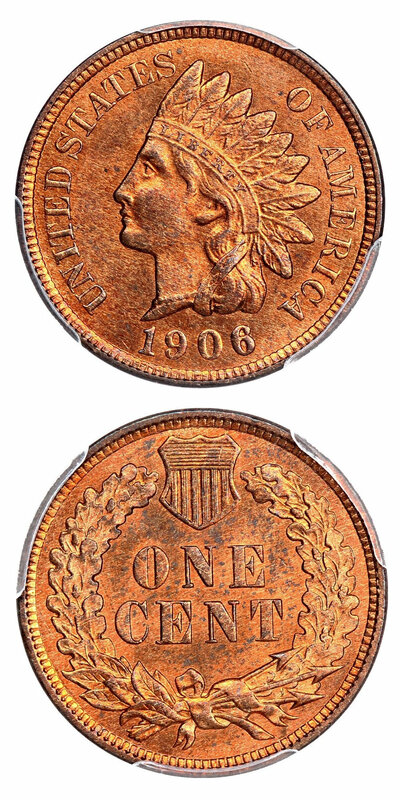 It’s an excellent value for this bright red, lustrous gem example of this popular Indian Cent type coin. Why we love it: A stunning, flashy example of this proof type coin for the Three-Cent Nickel Series that comes from a lower mintage of just 6,609 coins struck. This gorgeous gem is nearly perfect as it is blast white and simply immaculate as there are no detracting marks. Between those characteristics and the absolute ideal eye appeal, the CAC approval is well-deserved. Value: The PCGS Price Guide Value for this coin is set at $700 with the plus grade but not even factoring in the premium of the CAC sticker. We are offering this blast white pristine 3-Cent Nickel gem proof type coin at just $600 via our Make Offer function even with CAC approval. 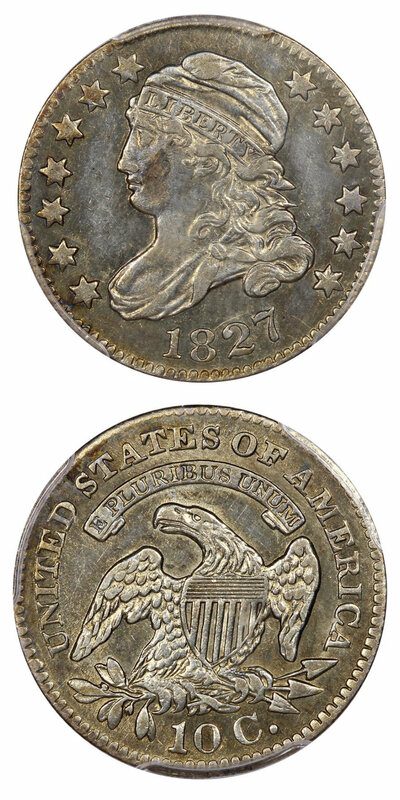 Why we love it: A great, affordable large size dime type coin for the popular Capped Bust Design. This piece is certainly of AU caliber as the wear is light and even across these subtly toned surfaces with mostly all details still sharp and clear. Value: The PCGS Price Guide Value and CPG Value for this coin are quite comparable at $700 and $660 respectively. We are offering this affordable Capped Bust Dime type coin below both price guides at just $575 via our Make Offer function. Why we love it: A better early date Liberty Seated Dime from the New Orleans Mint. Between the CAC sticker and lovely toning, this may be the nicest choice XF Seated Dime that you will find. Pretty peripheral toning on the obverse with blue-green highlights complemented by a gorgeous hue of lavender toning covering the reverse. Value: The PCGS Price Guide Value and CPG Value for this coin are set extremely far apart at an accurate $575 and a quite high $741 respectively. We are offering this nicely toned choice XF O-Mint Seated Dime at just $575 via our Make Offer function even with CAC approval. Why we love it: An affordable example of a scarce Carson City Mint Issue Twenty Cent piece that comes from a low mintage of just 133,290 coins. This coin represents its Fine grade well as the wear is not too deep and most of the details and design are still visible. 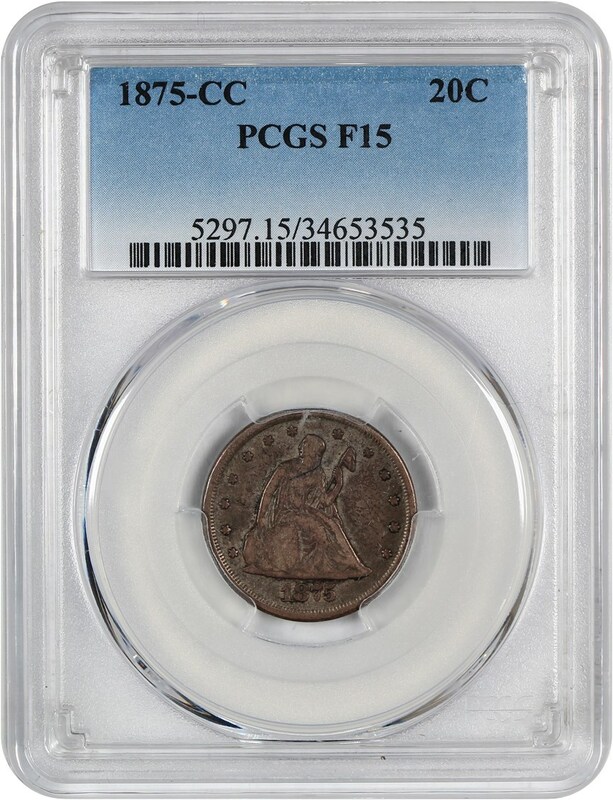 Value: Offered via our Make Offer function for $375, this coin has a much higher PCGS Price Guide value of $500. It’s an excellent value for this scarce and popular Twenty Cent piece that becomes much more expensive and rarer as the grade goes up. 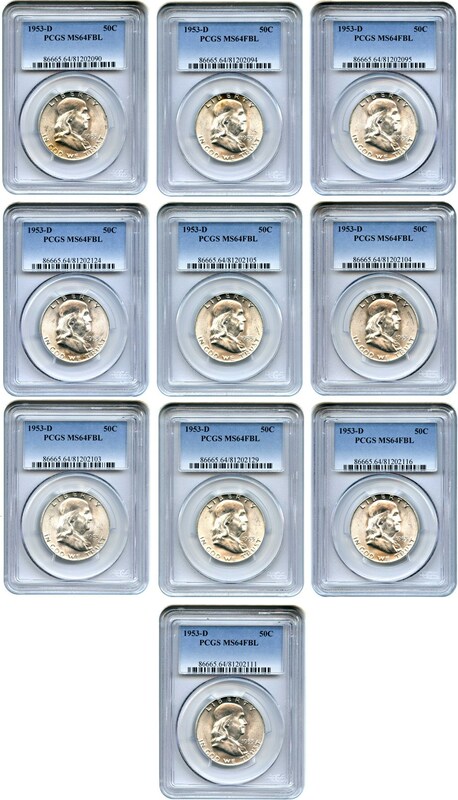 Why we love it: An intriguing lot of ten stunning, lustrous near-gem full bell line Franklin Half Dollar type coins. All the pieces display pristine mostly white surfaces that feature well-struck devices, few blemishes, clear full bell lines and strong luster. Value: The PCGS Price Guide reflects a combined value of $520 for this lot. The group is available for purchase at the fair price of just $400 via our Make Offer function. 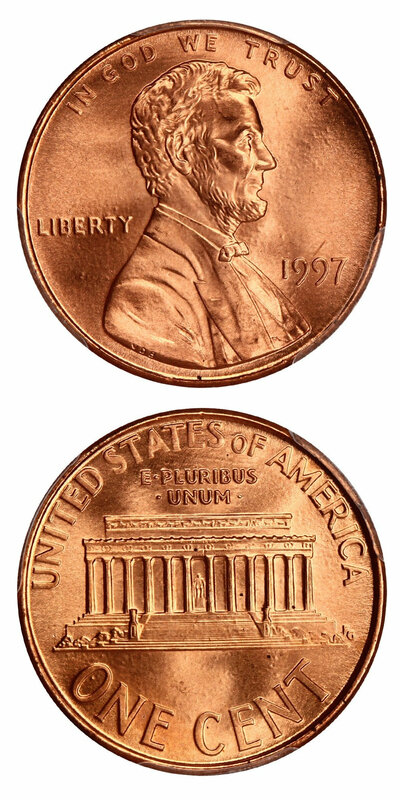 Why we love it: A perfect, bright red ultra-gem Lincoln Cent with incredibly strong, fully original luster. The eye appeal is stunning as this coin is simply blemish-free and of the highest registry quality. There are no finer examples of this Modern Lincoln Cent graded by PCGS with Red surfaces making this a finest known piece at that grading service. Value: The PCGS Price Guide has this coin valued at $850. It is available for purchase at the reasonable price of just $775 via our Make Offer function. 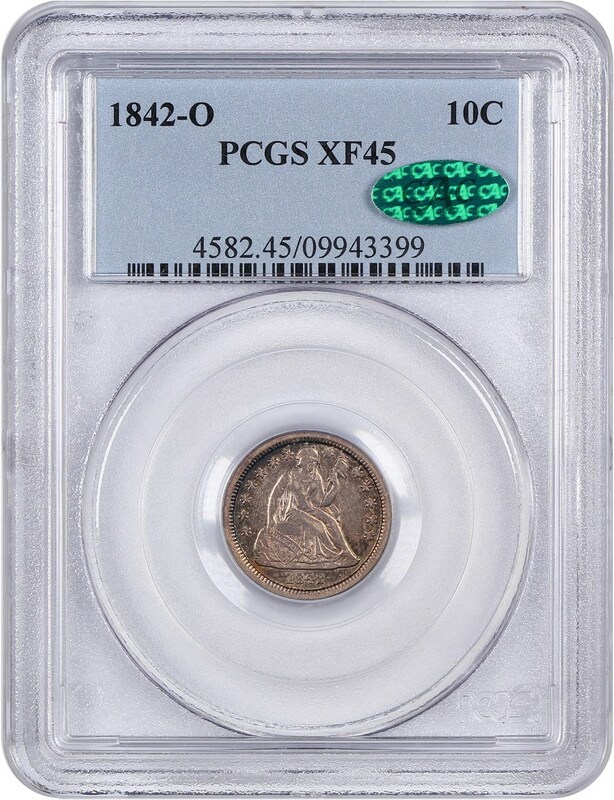 That is $75 below the PCGS Price Guide value for this immaculate, blazing red ultra-gem Lincoln Cent! Auction #1052 Lots Posted Live. Browse & Bid Now!